PENSACOLA, FLA - In the competitive Texas marketplace, Westin Homes has discovered a "secret weapon" for helping their homes stand out: decorative privacy windows. A leading Texas homebuilder, Westin Homes constructs 750 homes each year in neighborhoods and master planned communities. 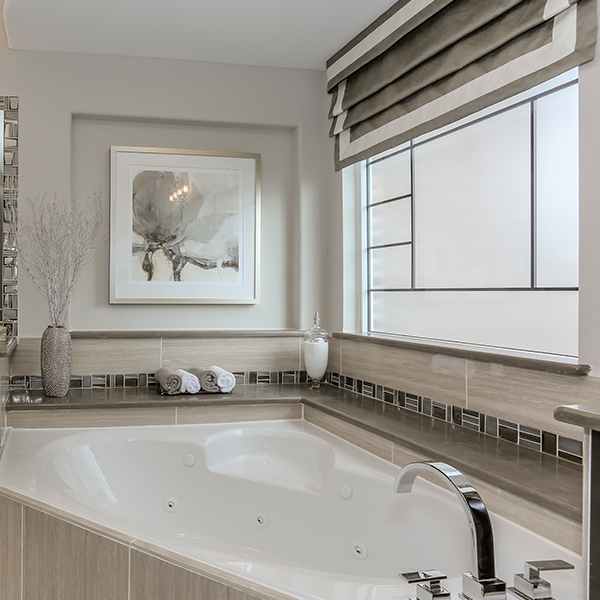 To offer homebuyers a unique option for their master bathrooms, the company now includes the Home Designer CollectionTM of privacy windows in Baroque, Prairie and Metro styles in their model homes. "The style of these windows is transitional, which ties in perfectly to the architectural styles of our homes," says Erin Riley, design director for Westin Homes. "These privacy windows appeal to a very broad audience and help buyers customize their homes to set themselves apart in a neighborhood. "Baroque, with its dramatic design inspired by classic and modern tile, is our most popular choice by homebuyers. The simple elegance of the Prairie style comes in as a close second. The Metro style was inspired by modern architecture and features a bold three-dimensional design. All of the windows feature silkscreened tempered privacy glass with clear lines to create memorable designs, while textured exterior privacy glass provides seclusion. Riley relates that the Prairie style opaque window in the Home Designer Collection complements the clear glass window package in several of her company's homes --- which also feature Prairie style lines. "Privacy windows like these can be used instead of decorative stained glass details in the home at a more affordable cost point," says Riley. "From our perspective, these designer windows set our homes apart; they're the next best thing in privacy windows. Period." From a design outlook, Mary Mansour, Model Interior Decorator with Westin Homes, agrees with Riley. "The subtle etching details and patterns on these windows are 'just enough' to add an element of luxury and custom look that today's master bath areas demand," says Mansour. "The designs complement the modern feel of our bathroom interiors and bring a bit of architectural appeal to the bathroom setting that our buyers find both refreshing and extremely functional." Available from Hy-Lite®, a leading manufacturer of acrylic block, glass block and decorative glass windows, the Home Designer Collection (which also includes a Mission style) includes fixed silkscreened windows in a variety of sizes, including 48" x 48", 48" x 12" and 36" x 60". For more information on Westin Homes, visit www.westin-homes.com.